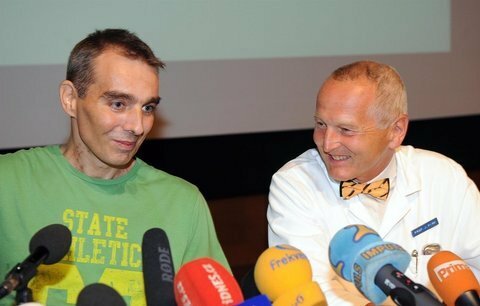 Jakub Halik, a Czech father of one who survived for more than six months without a real heart, has died at the age of 37. Jakub Halik had his heart replaced with two mechanical pumps in pioneering surgery last April after an aggressive cancerous tumor was found. Doctors say his death was caused by liver failure, and not the artificial heart itself. Jakub Halik, a former firefighter, was waiting on the transplant list for a suitable donor when he died. Despite not having a pulse and always having to carry a battery pack to power his mechanical heart, Jakub Halik was able to walk around and even use the hospital gym. He was not able to accept a donor heart earlier because the cancer meant he would not be able to take the drugs he would need for a successful organ transplant. The radical surgery had only ever been tried on one other patient, a man in Texas, who survived for just a week. Jakub Halik’s operation was carried out by Jan Pirk, director of cardiology at the Institute of Clinical and Experimental Medicine in Prague. His team used two plastic pumps, each designed to perform the separate tasks of the left and right sides of the heart. Speaking at a press conference in August more than four months after the surgery, Jakub Halik said he felt “very good physically”, and said he had made the right choice to proceed with the operation. “It was hard for me but I didn’t have any other chance at all,” he told reporters. He said the experience of living without a heart had not been difficult. “I don’t even realize it, because the functions of the body are the same, only my heart is not beating and I have no pulse anymore,” Jakub Halik said. Doctors said it is unclear how Jakub Halik’s liver failed. They are awaiting the outcome of a post-mortem examination.